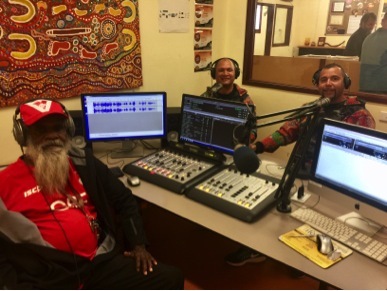 The main hub studio of Radio NGM was this month given an significant upgrade with the installation of a new digital fader desk in the studio, and digital switching equipment to handle the transmission of our radio stream from here to Imparja in Alice Springs. This work completes the upgrade begun last year with the installation of new playout software (and the hardware needed to drive it). 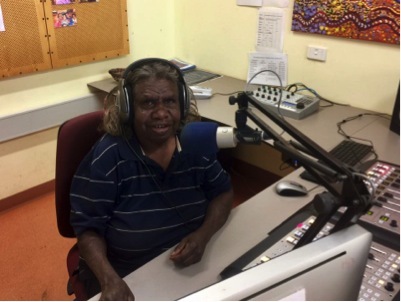 The photos show long term announcers, Roma Butler and Simon Butler learning how to work the new gear. Simon is conducting an interview with visitors from Queensland. The upgrade was made possible with funding from the Department of Prime Minister and Cabinet, and LotteryWest.